If I had to choose a favorite cuisine, it would be Mexican. It’s something that I really came around to during my first pregnancy, and it definitely stuck with me. Sadly, our only local Mexican restaurant closed it’s doors a few months ago – which means we have to drive 40 minutes north or south to go out…and that’s really sucked this time around as far as pregnancy cravings are concerned. 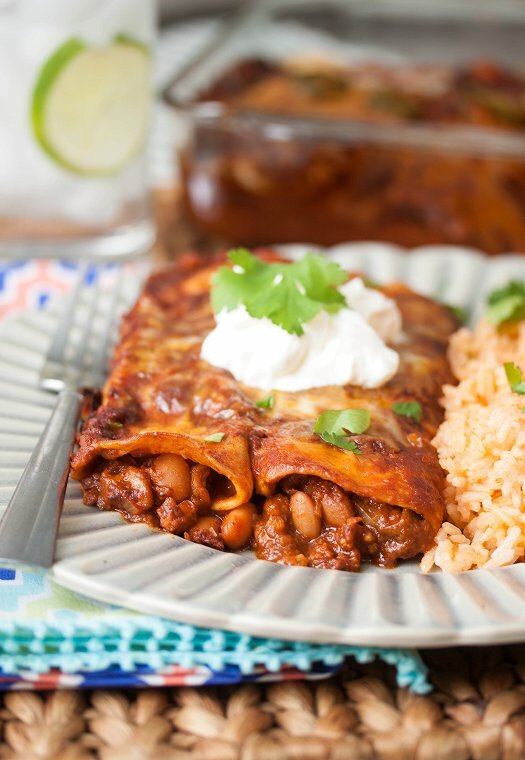 I already have a few really good enchilada recipes up my sleeve, but sometimes you just need something super-quick and easy. That’s where these bean and cheese enchiladas come in. I almost always have all the ingredients on hand to make them, they come together quickly, and they’re filling and delicious. They’re gooey and delicious with the use of flour tortillas and plenty of cheese. We all really loved them, Andrew declaring that they’re his second favorite enchiladas – right behind the beef. Which is really saying something considering that my chicken version was the favorite meal in the house for quite a few years! Preheat oven to 375 degrees. Spray a 9×13 inch baking dish with non-stick spray and set aside. Combine shredded cheeses in small bowl and toss to combine. Remove 1 cup of the cheese mixture and set aside for topping enchiladas before baking. Place olive oil in large skillet and bring to medium high heat. Add onion and cook until translucent, about 3 minutes. Add the beans and continue to cook for another 3 minutes. Add the garlic and tomato paste and combine mash around to coat the beans in the paste, let cook until starting to brown – about 3 minutes more. Add the chicken broth and stir to combine. Bring to boil and reduce temperature to low. Cook uncovered until most of the liquid has reduced. Add the can of green chilies and stir to combine. Remove from heat and season to taste with salt. To assemble tortillas, place about 1/4 cup bean and 3 Tbsp shredded cheese into each tortilla. Roll up and place in the baking dish. Repeat with remaining tortillas, filling, and cheese. Top enchiladas with the enchilada sauce, as well as the reserved cheddar cheese. Cover baking dish with aluminum foil and place in oven. Bake for 30 minutes, remove foil, and bake for 15 minutes more until cheese is melted and started to brown. Remove from oven and cool for 10 minutes before cutting and serving. Garnish with sour cream and fresh chopped cilantro. I’m with you, Mexican food is probably my favorite cuisine! I love how quick and easy this recipe is, great for an easy weeknight dinner! Elizabeth @ bowl of delicious! Yum! I made enchiladas a couple of weeks ago for the very first time and was surprised at how EASY and quick it was! My husband is from Texas and we live in Massachusetts and, since his palette for good Mexican food is very refined, we tend to just make our own (good Mexican in New England doesn’t exist!). Thanks for the recipe, I’m excited to try this out! I love Mexican food! I can’t wait to try these enchiladas. I have been on quite a Mexican food kick lately. These sound excellent!